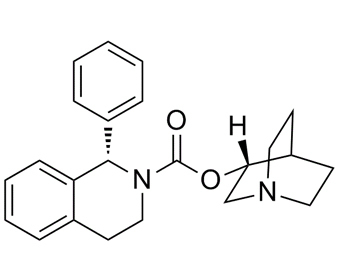 Solifenacin (YM905) is a competitive muscarinic receptor antagonist. The binding of acetylcholine to these receptors, particularly the M3 receptor subtype, plays a critical role in the contraction of smooth muscle.
. Ikeda K, et al. M(3) receptor antagonism by the novel antimuscarinic agent solifenacin in the urinary bladder and salivary gland. Naunyn Schmiedebergs Arch Pharmacol. 2002 Aug;366(2):97-103.
. Suzuki M, et al. Effects of solifenacin succinate (YM905) on detrusor overactivity in conscious cerebral infarctedrats. Eur J Pharmacol. 2005 Apr 4;512(1):61-6.